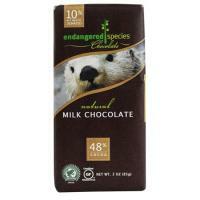 Endangered Species Chocolate is a mission-driven company that is passionate about chocolate and the environment. We are committed to providing chocolate-lovers with premium, natural chocolates that are ethically traded and sustainably grown. Adding to the impact of each chocolate bar, we donate 10 percent of net profits to fund species and habitat conservation.